Welcome to waxahachiebible.org. We are so glad that you are checking out our church. Our hope is that through the pages of this site you will better understand us and the mission we are pursuing here for the glory of God. We also have a printable "Welcome to WBC" booklet providing lots of valuable information to help you get better acquainted. The entire worship service in audio or video format is available on our media page. Our Sunday morning bulletin might also be helpful to you to get a feel of the things that are going on and available for you at Waxahachie Bible Church. Here is the latest posted bulletin. "Duplicating Discipleship" course can be purchased through AMAZON.com. This 15 chapter study was written by 13 different authors from WBC and then edited and proofed by others from the WBC family. The course has already been utilized in home groups and one-on-one mentoring partners and is now being used in several churches and ministries. Printed version are available at Waxahachie Bible Church for free. Ebook is available here. "WBC exists to glorify God through the teaching of the Bible and discipling people of all ages to fulfill their purpose in Christ"
Thirteen different authors from Waxahachie Bible Church came together to write a discipleship course based on the importance of following good examples. There are 15 lessons included in this study for use in discussion with home groups or Bible studies or in use with one-on-one mentoring relationships. Printed version of the course are available for free in the books racks at Waxahachie Bible Church. We would love the opportunity to pray for you. Please consider completing this form for any prayer need you may have. You may choose to remain anonymous, or have a member of the prayer team contact you if you'd prefer. Check our Connection Points for visitor information and to learn more about WBC. 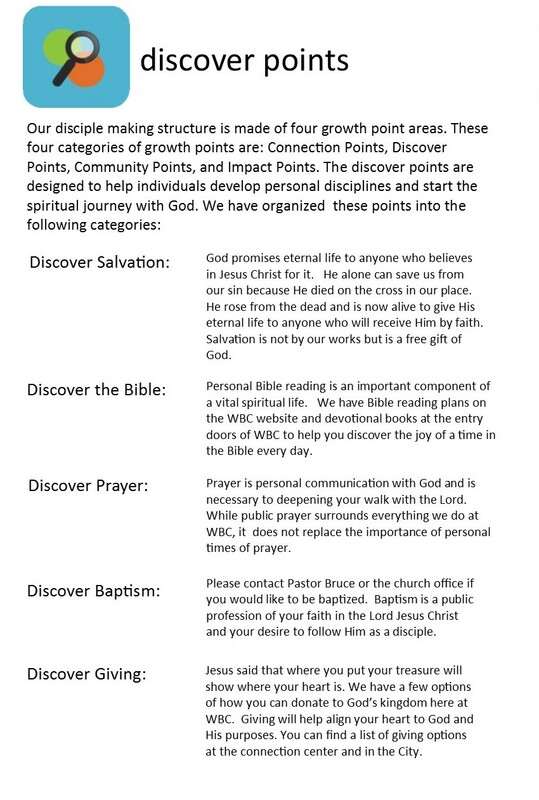 Check out our Discover Points, designed to help you develop personal disciplines and start the spiritual journey with God. Check our list of Community Points to get connected. Here is a map of current active home groups and those being formed right now. Looking for a place to serve? Growing together in community involves loving and serving other people. to make an impact in their life and world. Here are our impact points. Have you been to Realm? We would like to encourage and invite you to check out Waxahachie Bible Church on REALM. REALM is the primary communication tool among the Waxahachie Bible Church family and its ministries for announcements, prayer requests and serving opportunities. It it not intended to replace personal contact ministry but enhances and engages the congregation to understand quickly the needs and opportunities for people to engage with one another personally. Take the next step in getting connected to the WBC church family.